Stockton, CA - Western Flat Rolled Steel, a division of Schaeffer Industries, Inc., a large distributor and processor of flat rolled carbon steel coil, has installed a new high-speed slitting line with an automatic slit coil-packaging line in its new plant in Stockton, CA. The new equipment system, designed and manufactured by Braner USA, Inc., Schiller Park, IL, is capable of processing 50,000 lb x 60" wide hot rolled and cold rolled coils in gauges from .010" through 1/4" at line speeds up to 1,500 FMP. The coil packaging line will handle slit coils from 1" through 24" wide and automatically sort and palletize coils into packages weighing up to 10,000 lbs. High Pass Line: The new slitting line employs the latest "high pass line" equipment arrangement that positions the strip processing components above the coil OD rather than at floor level common with older slitting lines. The high pass line arrangement allows the coil to be unwound, threaded through the line, slit, and rewound without being "reverse bent" against the natural coil-set. 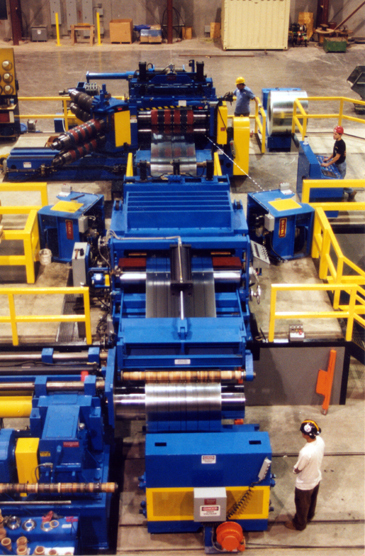 High pass line benefits include: faster coil threading, elimination of cross-breaks, improved coil tracking as the Uncoiler and Recoiler are positioned closer to the pass line rolls, and better surface quality as the strip rides "over" all pass line rolls rather than "under," as is the case with older floor level lines. 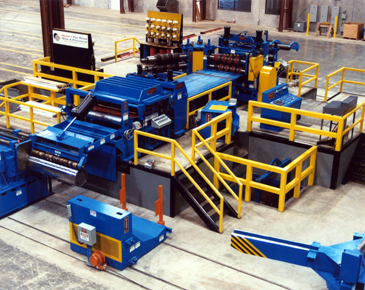 Turret Head Slitter: The Western Flat Rolled slitting line includes a quick-change precision "Turret" slitter equipped with three 9" x 60" slitter heads. Turret Head slitters are designed to virtually eliminate slitter head change down time. All three slitter heads are mounted in a massive precision-machined one-piece rotatable "turret" housing supported on a 300,000 lb capacity rotation bearing that maintains perfect alignment of all slitter heads at all times. Slitter head exchange time is one minute. Arbor parallelism and knife vertical clearance is displayed on large character electronic readouts interfaced with precision electronics encoders. Vertical arbor adjustments and outboard bearing travel are pushbutton operated to reduce changeover time.